The amount of open and free satellite earth observation data combined with available data from other sectors (e.g. biodiversity, landscape elements, cadaster data) has the potential to enhance decision-making processes in various domains. An example of such a domain is agriculture, where the ability to objectively and automatically identify different types of agricultural features (e.g., irrigation patterns and landscape elements) can lead to more effective agriculture management. 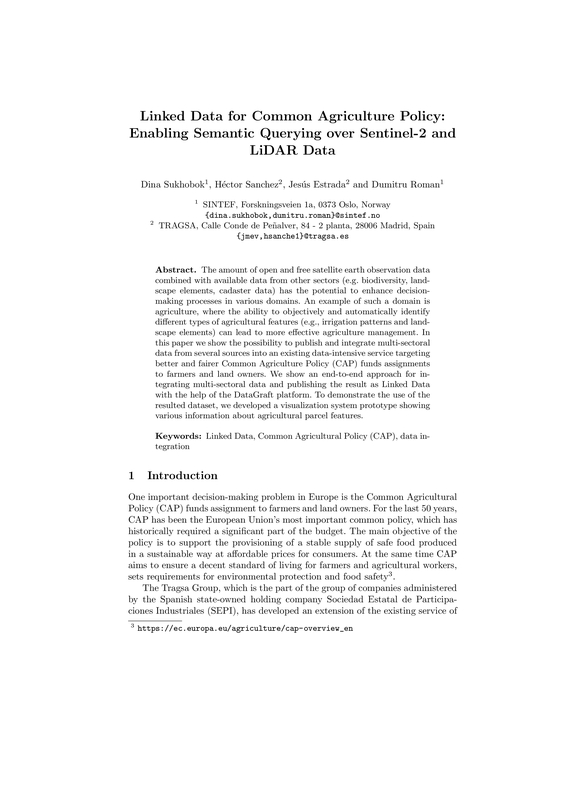 In this paper we show the possibility to publish and integrate multi-sectoral data from several sources into an existing data-intensive service targeting better and fairer Common Agriculture Policy (CAP) funds assignments to farmers and land owners. We show an end-to-end approach for integrating multi-sectoral data and publishing the result as Linked Data with the help of the DataGraft platform. To demonstrate the use of the resulted dataset, we developed a visualization system prototype showing various information about agricultural parcel features.